Battle Comp Enterprises, LLC has partnered with Mossie Tactics and Surefire, LLC to create a light and mount package to includeyour choice of Mossie Midnight Mount and the Surefire X300 Ultra. At his price, it’s almost like getting the Mossie Mount for free! 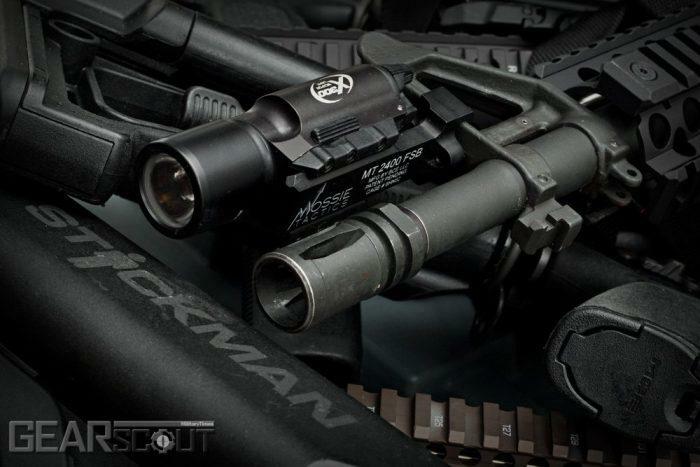 All MMM’s are designed to place a weaponlight at 12 o’clock for ambidextrous and wireless use. Precision CNC-machined from 6061 T6 billet Aircraft Aluminum. Military Type III Hard Anodized. Please indicate in the notes which MMM version you want with your package. The powerful and versatile SureFire X300 Ultra WeaponLight for handguns and long guns features a high-performance LED that generates 500 lumens of stunning white light focused by a Total Internal Reflection (TIR) lens to produce a tight beam with extended reach and significant surround light for peripheral vision. The virtually indestructible and highly efficient LED generates tactical-level light—more than enough to overwhelm an aggressor’s dark-adapted vision—for 1.5 hours per set of batteries. Activating the X300 Ultra is done via ambidextrous switching located at the rear of body, providing one-finger control — press the switch on either side for momentary-on activation, flip up or down for constant-on activation. The X300 Ultra can be attached to a pistol or a long gun since its Rail-Lock® system permits rapid attachment to and removal from either Universal or Picatinny rails. Its high-strength aerospace aluminum body is Mil-Spec hard anodized for superior toughness and is O-ring and gasket sealed to make it weatherproof.